As robotics, automation and AI steadily improve, I’ve been thinking a lot about what will keep the human workforce busy in the years to come. How much longer will we need to park ourselves at our desks for hours on end in order to pay our bills? 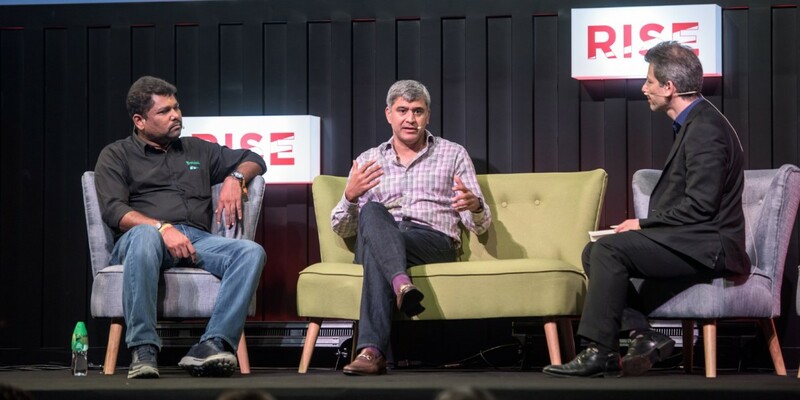 At the Rise conference in Hong Kong yesterday, customer support service Freshdesk’s CEO Girish Mathrubootham and Google for Work president Amit Singh shared their thoughts on the future of productivity. These days, we want to be able to access our customer support email from wherever you are. Traditional software chains you to your desk and require you to use a VPN when you’re on the move. The convenience of working from anywhere that modern apps offer, is what is driving the shift from desktop-focused to mobile and cloud-based solutions. Singh feels that new apps are more about collaboration for increased productivity and less about our contributions as individuals. “The new sharing economy and the way millennials think, have combined to create a new collaborate work culture. We’re now working on the same files together and messaging each other all in one place. It’s more about real-time teamwork and transparency than individual effort,” he said. Is there an end in sight for email? There are some aspects of email as a method of communication that are useful, like searchability and keeping correspondence on record. But it won’t just vanish in the years to come — it’s more likely to evolve and adapt to our needs for faster and more streamlined collaboration. Isn’t it risky for businesses to put all their data in the cloud? The cloud is a lot more secure than companies’ own bespoke security infrastructure. We know what it takes to secure Google’s system. We’ve built everything from scratch, from our data centers to our platforms, and we spend a lot of time protecting our network. Not to say that bad things can’t happen, but it takes a lot of time, money and effort to build secure solutions. The transition to cloud-based infrastructure will be because of security and not in spite of it. How is the way we work going to change in the next five years? We’ve been thinking a lot about the the increasing importance of mobility at work. We’re currently taking traditional data and tools and unlocking them from your desk. But creating an intelligent assistant that goes where you do and helps you out by surfacing data when you need it, in context, cognitive in real-time — I believe that’s the future. The search giant acquired machine learning firm DeepMind last year to boost its AI efforts, so it’ll be interesting to see how Google follows up on Singh’s vision.